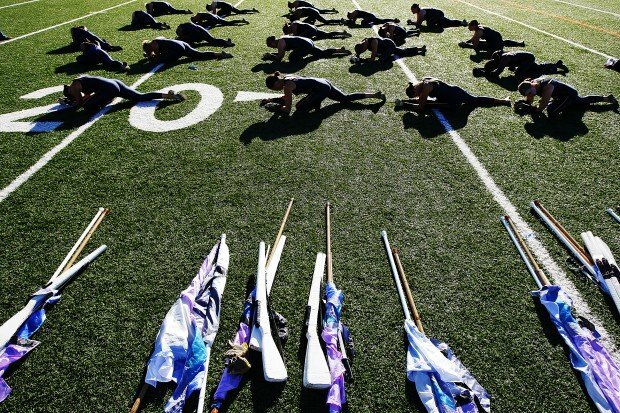 World-class drum and bugle corps color guard is not made up of young people who want to sleep on buses, spend money instead of make money in the summer, and can't blow a horn or bang a drum. Color guard is an integral third of the corps, along with brass and percussion. Color guard adds additional visual appeal to a performance and is judged along with brass and percussion. 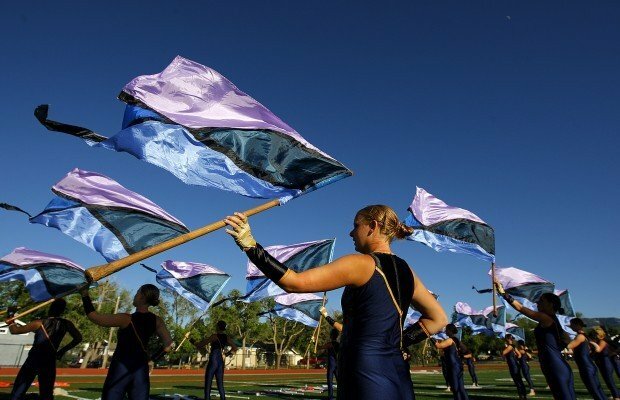 Although patriotic flag color guards are not as apparent as they once were in drum corps history, color guard members spin colorful flags, sabers and rifles, and often dance to interpret the music. They practice, practice, practice, making certain their rifles are thrown to a certain height and their flags spin a certain way. They need the grace of a ballerina and the athleticism of a hurdler. "Color guard has risen so far to the top. It's not just an easy walk in the park," said third-year Melissa Luell, who is the color guard captain for the Troopers Drum & Bugle Corps. Luell credits the staff with the improvement she and her 31 other guard mates have made this season. The 32 color guard members are the largest ever in the Troopers, and include a weapons line of eight rifles and sabers, with an additional eight rifles used at times during the show. All 32 spin flags, and just try that when the wind is blowing 40 miles an hour with gusts to 65. "The staff is so great. They really mold us into great color guard performers," she said. Luell went to high school in Friendswood, Texas, and knew some of the staff when she decided to become a Trooper three years ago. She had marched color guard for all four years of high school and independent winter competitive guard for two years. She explained this year's show, "Wanted," in which the guard plays an integral role. "Each song is a different form of want. The first is harsh, demand; the second, the ballad, is wishful wanting; the third is lusty craving; and the fourth is, 'I need this.'" She'll be a senior in the fall at Rowan University in New Jersey, majoring in elementary education and history. She ages out in August, meaning she will be too old for drum corps next summer, but for now, those rifles and sabers and flags will keep spinning, telling the story of what hard work and improvement can achieve. Kim Singree of Chesapeake, Va., is in her second year as a Trooper, and she was amazed at the difference in comfort she felt from her first preseason rehearsals last season to this season. "Last year, I was a fill-in and I got here in the second half of all-days," she said. "It was so stressful. I was so far behind when I got here." She is a dancer during the ballad piece and spins flags during the rest of the show. She had some dance experience before guard, but not much. "Dance in color guard is a lot different than dance in the studio," she said. She calls drum corps "one of the best things I've ever done. I have learned so much, especially how much you can push yourself." When she watches the DVD of last year's top 12 finish at DCI World Championships, she thinks, "Wow, I really did that." She will be a senior at Hickory High School in Chesapeake in the fall. And so what about a rifle or flag drop during a critical part of the show? "Recovery is the most important part. If you drop, you get right back in. You don't stand there and think about it," she said. She calls the show's final number her favorite, saying it showcases how talented the Troopers brass and percussion are. Amanda Kreeger stands in the empty gym, leather gloves on, intent on stealing a couple of minutes of extra practice. She tosses her white rifle, and it spins. And she catches it. And tosses again, and it spins. And she catches it. And guard mates walking by automatically shout out the count, and the rifle spins. And she catches it. She said this year's guard uniforms, which were kept a complete secret before the competitive tour began, reflect the theme of the show. "It's like the corps are normal people who have given into temptation and the guard is more innocent, more naive, more wishing, when the show begins," she said. "And then later on, it shows that we're like all people who give into temptation." Well, not exactly. Not all people throw and spin and catch in front of thousands of people and the total chaos that 140 bodies can create for 10 minutes at a time -- counting, always counting. Watch for Troopers Tuesday each Tuesday in the Star-Tribune. Troopers placing and score listed first; show winner and score in parentheses. June 30: Medford, Ore., Best of the Rogue, 7:30 p.m.
July 2: Salem, Ore., Drums of Fire, 7:30 p.m.
Coverage of the Troopers Drum & Bugle Corps from Casper, Wyoming from May 2009 to the present.